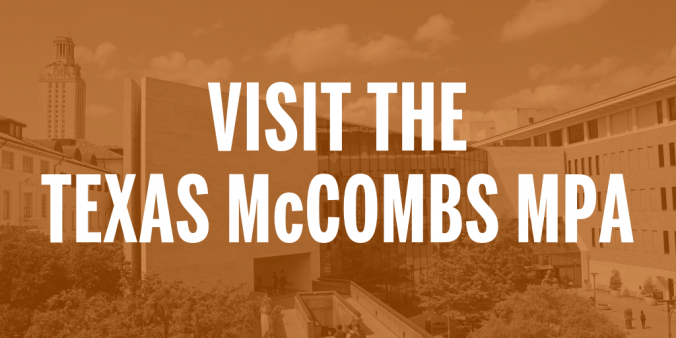 Visit the Texas McCombs MPA! We encourage prospective and admitted applicants to visit Texas McCombs to learn more about Austin, the MPA curriculum, career opportunities, our faculty, and the MPA experience. Admitted applicants are invited to attend MPA Preview Day on either Friday, February 15 or Friday, March 29, to explore the MPA program, meet your future classmates, and celebrate your admission. Admitted applicants who are unable to attend MPA Preview Day and all other prospective students can arrange a customized visit schedule by submitting the visit form to the MPA Program Office at least two weeks prior to your planned visit.